September 11 attacks-Horoscope,astrology & Numerology Lessons and Prayers to avoid any such Attacks in Future to any Country! The September 11 attacks (also referred to as September 11, September 11th, or 9/11) were a series of four coordinated terrorist attacks by the Islamic terrorist group al-Qaeda on the United States on the morning of Tuesday, September 11, 2001. The attacks consisted of suicide attacks used to target symbolic U.S. landmarks. One of the other flights – had number AA77= now 77= 7X11!, you see 7 times 11! The twin towers look at the symbol for number Two symmetrical towers standing. This clearly indicates the entire world suffering due this attack. This is what the vibrations are in the world that time. America is ruled by number 5 = mercury. Date 11= moon= water with a basic fire as well. (Month September = 9th month and 9th = mars= fire.). Also the Moon and mars not friends. It creates lot of strife, destruction and anger . The effects incoming year 2002= 2 X 1001 = kind of 2 X 11(as far as number representation is concerned and ignore zeros)! Also 2002 = 2+0+0+2 = 4 = Rahu/dragons head/Uranus. Now adding once again 9+7 =16! Number 16 Meaning- as it has the double 16 energy hidden in it! “This number has a most peculiar occult symbolism. It is pictured by “a Tower Struck by Lightning from which a man is falling with a Crown on his head.” It is also called “the Shattered Citadel”. It gives warning of some strange fatality awaiting one, also danger of accidents and defeat of one’s plans. If it appears as a “compound” number relating to the future, it is a warning sign that should be carefully noted and plans made in advance in the endeavour to avert its fatalistic tendency. Now what happened at world trade center would explain the meaning. Now world trade center as the name suggests was ALSO a powerful centre and had command and control, before the tragedy struck.So both the above interpretations( Number 16 ad Number 27) stand true! We should have prayers for all. Buildings should not only be made stable from civil engineering perspective- but vaastu/fengshui and numerology/astrology affects should also be added I 21st century for betterment of humanity. Two of the planes, American Airlines Flight 11 and United Airlines Flight 175, were crashed into the North and South towers, respectively, of the World Trade Centre complex in New York City. 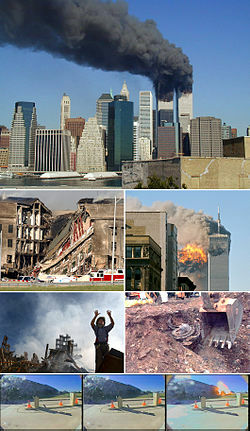 Within an hour and 42 minutes, both 110-story towers collapsed with debris and the resulting fires causing partial or complete collapse of all other buildings in the World Trade Centre complex, including the 47-story 7 World Trade Centre tower, as well as significant damage to ten other large surrounding structures. A third plane, American Airlines Flight 77, was crashed into the Pentagon (the headquarters of the United States Department of Defence) in Arlington County, Virginia, leading to a partial collapse in the Pentagon’s western side. The fourth plane, United Airlines Flight 93, initially was steered toward Washington, D.C., but crashed into a field near Shanksville, Pennsylvania, after its passengers tried to overcome the hijackers. Rahu-Ketu( number 4-7)Axis and Terrorist Attacks ,A Numerology Analysis! Barack Obama Horoscope-The 44th President of USA. Strange Number & Planetary Coincidences in His Life!! !